The Eureka Police Deparment is offering a free training on how to survive an active shooter incident to citizens on Thursday, March 3. EPD Administrative Technician Suzie Owsley said that the training is just one of many community public safety events that Chief Andrew Mills has requested. "This topic seemed to be timely," Owsley said. "This was high on his list to offer to the citizens of Eureka." Several active shooter events have occurred regionally in the last few months, including a shooting in San Bernardino on Dec. 2, 2015, and an attack on Umpqua Community College in Oregon on Oct. 1, 2015, the latter of which left a Humboldt County native, Jason Dale Johnson, dead. Owsley said the training will include speakers from EPD and information about how to properly report an incident to a dispatcher. The training has already been offered to several local companies, although Owsley declined to say which. Owsley added that other training opportunities and community-oriented meetings will be available over the next year. "Chief Mills is getting ready to roll out strategic planning that involves input from the community," Owsley said. "This will take place in the near future. The planning will encompass additional training on crime prevention topics such as [crime prevention through environmental design), situational crime prevention and traffic calming, just to name a few." 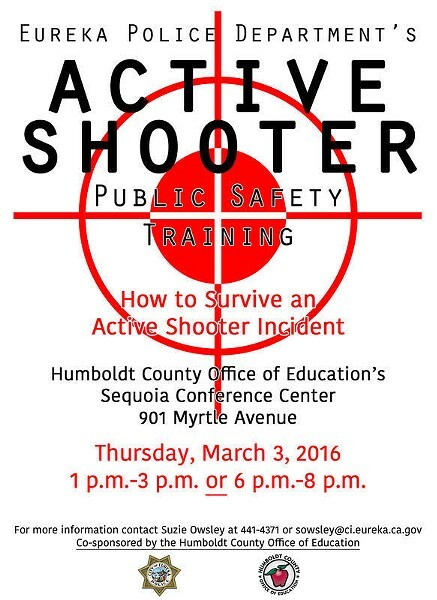 EPD along with the Humboldt County Office of Education will host training in how to survive an active shooter. It is open to the public. Led by Captain Brian Stephens and Senior Dispatcher Katie Hill, the training will describe what action you might take to improve your odds of survival. Two classes available on Thursday,March 3rd. 1-3 p.m. or 6-8 p.m. at the Humboldt County Office of Education's Sequoia Conference Center, 901 Myrtle in Eureka.